Today is National Watermelon Day. To celebrate, I knew I had to combine this juicy summertime fruit with my favorite dessert... cupcakes! The only problem is, it is pretty hard to get a true watermelon flavor into a cake, without it tasting artificial. So I came up with an even better idea, and made "cupcakes" out of actual watermelon slices! I topped them with some non fat greet yogurt and a melon ball "cherry" to finish them off. Introducing my most refreshing, low calorie cupcake ever... the watermelon slice cupcake! Kids and adults alike will love the juicy watermelon "cake" topped with a creamy yogurt topping, adorned with a melon "cherry". These watermelon slice cupcakes are so simple to make, using only a few simple ingredients. The best part is, there is no baking required for these sweet little treats, making them perfect for an on-the-go warm summer day snack, outdoor gathering, or a healthy dessert. Cut watermelon into 2 1/2" tick slices. Lightly press a 2 1/2" round cutter into watermelon slices making a circle imprint. Using a sharp knife, cut downward at an angle, using the circle as your guide, creating a "cupcake shaped" chunk of watermelon that has a 2" diameter at the base with your 2 1/2" diameter top. Level the top off with your knife if necessary. Using a melon baller, scoop out watermelon "cherries" for each of your watermelon slice cupcakes. Dry melon balls with a paper towel, so there is no extra juice to leak onto your topping. Place each of your watermelon "cakes" into a foil cupcake liner. Just before serving, scoop yogurt or whipped topping into a piping bag fitted with a star tip and pipe on top of melon cakes, or spread on top with a knife. I used pineapple flavored greek yogurt because of its sweet taste and thick texture, making it easier to pipe and hold its shape. Top with sprinkles or granola for a sweet textured crunch, and adorn with your watermelon "cherry" for a low cal, delicious healthy treat everyone will love! 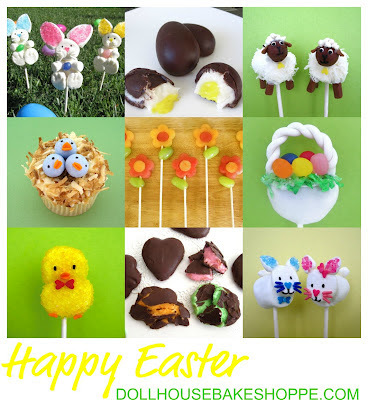 Click here to check out more Easter & Spring treats!